Breeders who utilised the services of dual Group 1-winning two-year-old Pride Of Dubai during his first covering season in the northern hemisphere this year will be pleased to learn of his first arrival at Coolmore Australia. 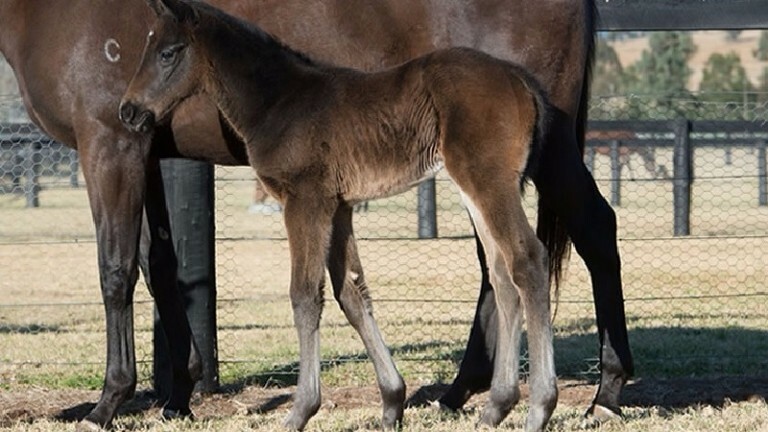 Bred by Pride Of Dubai's owner-breeder Sheikh Mohammed Bin Khalifa Al Maktoum, the filly is the second foal out of the unraced High Chaparral mare Isstoora, another to be bred and raced by the sheikh. Isstoora is out of the Group 3 winner Murjana, a half-sister to the dam of Group 1 winner Gathering from the famed Dancing Show family that has produced champion sire Redoute's Choice and Group 1 winning sires such as Manhattan Rain, Umatilla, Hurricane Sky, Al Maher, as well as up and coming Coolmore sire Rubick. "His Highness has been looking forward to the first Pride Of Dubai foals for quite some time," said Tim Stakemire, racing and breeding manager to the sheikh. "This filly appears to have inherited all of the best physical characteristics of her sire, which is very exciting. His Highness supported him with a large volume of quality mares in his first season and he is very much looking forward to racing his offspring in years to come. "Invincible Spirit, to whom Pride Of Dubai is closely related, sired his 101st stakes winner the other day. While Kodiac, who is a three-quarters brother to the dam of Pride Of Dubai, is on track to break the world record for the most two-year-old winners in a calendar year. It is a potent stallion producing family." Foaled and raised in the paddocks of Coolmore Australia, Pride Of Dubai won the 1200m Blue Diamond Stakes and 1400m Sires' Produce Stakes during a sparkling juvenile season. The son of Street Cry attracted 177 mares in his first covering season in Australia, and stood the past season at Coolmore Ireland at a fee of €15,000. He will stand at Coolmore Australia this year at a fee of A$44,000 (£26,800/€29,600).